Zambroza is made from the valued and exotic-tasting mangosteen and goji berry fruits from the orient, which have been combined with the additional antioxidant power of red and concord grapes, raspberry, blueberry, grape seed and grape skin, apple extract and decaffeinated green tea extract. This is Nature’s Sunshine’s product - a great tasting, synergistic blend that helps to increase vital energy and replenish the body. 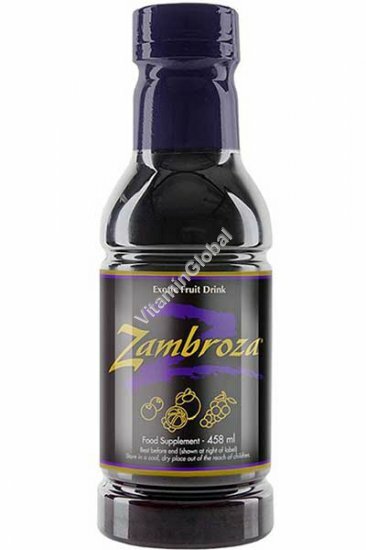 Zambroza formula contains: Mangosteen, Wolfberry, Apple Extract, Raspberry, Concorde Grape, Grape Seed, Grape Skin, Green Tea and Red Berry. Recommended Usage: Dosage (adults): Take 15 mL (1/2 oz.) daily. A second 15 mL dose may be taken each day if desired.